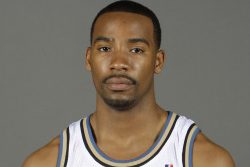 Former NBA player for the Washington Wizards, Javaris Crittenton has been charged with murder. He shot a 23-year woman/mother of three on August 19th in Atlanta. She was not the intended target, but he was attempting to kill someone he believed robbed him back in April. The victim was taken into the hospital for emergency surgery for the gunshot wound to her hip, but she died on the operating table. Crittenton is running as a fugitive like the slime that he is. If you don’t remember, he’s the other NBA player that was busted for guns in the locker room with Gilbert Arenas. Yeah, this guy is all kinds of stupid. R.I.P. to the poor victim. Our thoughts are with her now motherless children.